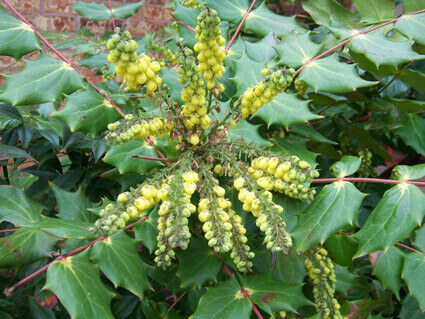 Mahonia Bealei is sometimes treated as a separate species to the Mahonia Japonica, and sometimes as a cultivar of the Mahonia Japonica species, under the above name. Its most obvious differences from the type are in shorter racemes and wider leaflets. 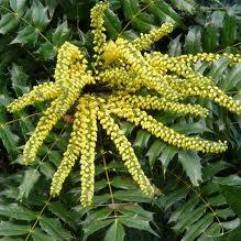 This shrub has evergreen, leathery fern-like foliage. 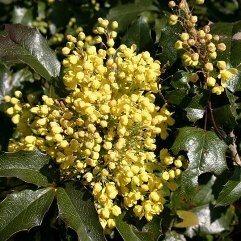 In Spring and Summer, it flowers in yellow chains up to 30cm long and 5 - 8cm wide. 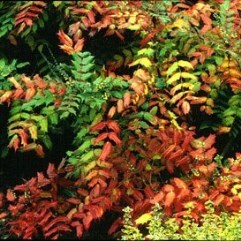 These are followed by purple berries (not to be eaten) in Autumn. Height 2 - 2.5m. Width 1.5 - 2m.